IS IT SAFE TO LOG IN TO RIGHTSENFORCEMENT.COM? NO. Even CEG-TEK [who now looks like an angel compared to their RIGHTS ENFORCEMENT evil twin] had trackers and issues with their website. I always told recipients of their DMCA scare letters to be very aware of what websites they visit and what trackers are embedded in those websites. 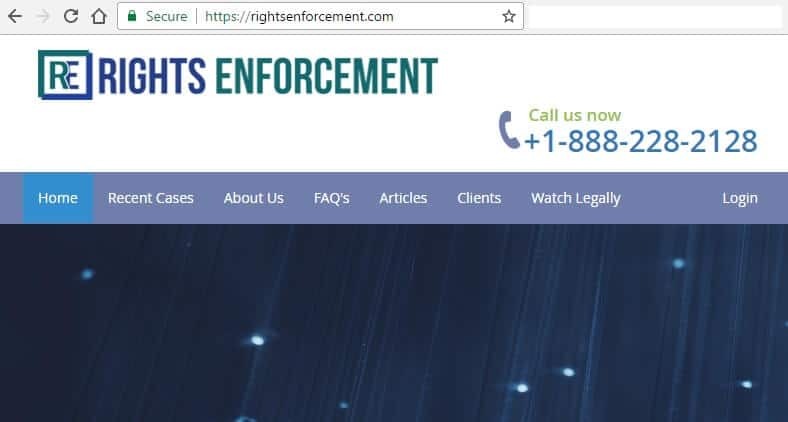 IS THERE ANY LEGAL DANGER TO LOGGING ON WITH MY CASE NUMBER AND IP ADDRESS TO THE RIGHTSENFORCEMENT.COM WEBSITE? YES. When you log into the RIGHTS ENFORCEMENT website, *YOU CREATE A RECORD WHICH PROVES THAT YOU WERE GIVEN THE ABILITY TO SETTLE* which can later be used against you in a lawsuit if you choose not to settle, or if RIGHTS ENFORCEMENT somehow plays a game and causes your settlement to crash. More importantly, RIGHTS ENFORCEMENT is able to track which accused internet users logged into their website using the provided Case Number and Password (here, your accused IP address). By logging in, they will create a record and a log which captures data about who is logging in (which IP address you are coming from, what computer you are logged into, what kind of computer it is, possibly what the MAC address of that computer is), how long you are logged in for, and whether or not you settle the claims against you. It goes without saying that this record can be used to justify a higher settlement amount offered after the lawsuit has been filed, and it can be used to prove that the accused defendant (once sued) had a chance to settle, but chose not to settle. In sum, for these reasons alone, if you receive a notice in your inbox (or in the mail), QUASH YOUR CURIOSITY AND DO NOT LOG INTO THE RIGHTSENFORCEMENT.COM WEBSITE. INSTEAD, CONTACT AN ATTORNEY (me, or anyone else), AND LET US HANDLE THE ISSUE FOR YOU. WHY I AM ABLE TO SHARE THESE DETAILS WITH YOU. The reason I already know what the issues are surrounding logging into the RIGHTENFORCEMENT.COM website is because I have already gone through years figuring it out from the CEG-TEK business RIGHTS ENFORCEMENT reverse engineered (a.k.a., ‘stole’, or ‘copied’ is likely also an accurate description). Based on my many years of dealing with the CEG-TEK website, where CEG-TEK was only interested in stopping piracy (and making a modest profit along the way), there were barbs and traps built into their website that any sensible person would have known to stay far away from, and although we made them the villains on our website for their business model of scaring accused subscribers into settling, compared to Carl Crowell (the owner of RIGHTS ENFORCEMENT), CEG-TEK now look like angels. You can read for yourself who Carl Crowell is, what his reputation is, and what things he has said and done to those he has already accused of copyright infringement. Let’s just say it’s worse than anything you could imagine, but my job here is to share the FACTS, not the opinions about the character of the attorneys. For that reason, ASSUME WISELY THAT THERE ARE TRAPS AND BARBS BUILT INTO CROWELL’S RIGHTSENFORCEMENT.COM WEBSITE, AND STAY AWAY FROM IT AT ALL COSTS. Obviously, if you want my help circumventing his traps, I already know what to look for and how to get around them. Previous PostRIGHTS ENFORCEMENT’S KNOWN ‘MOVIE’ CLIENT LIST.Next PostWHAT IF MY RIGHTS ENFORCEMENT DMCA NOTICE DUE DATE EXPIRED?